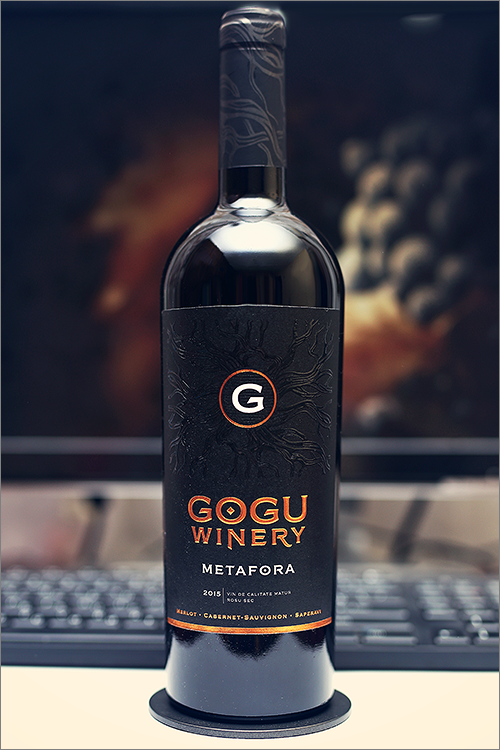 Tonight we are going to review yet another wine blend with the label ‘Made in Moldova’ – Metafora 2015 by Gogu Winery. This is the winemaker’s flagship wine – an already traditional local blend made of merlot, cabernet sauvignon and saperavi grape varieties, where the last one is the key of the whole blend, adding those much desired and sought after leathery notes. Produced in the famous Stefan-Voda region in the south-east of Moldova, this wine has been aged for 10 months in french oak barrels. Needless to say that the wine has been produced in a very limited edition of only 800 bottles, but let’s skip the theory side and, without further ado, let’s get straight to the tasting! Deep garnet color, not too opaque, with crimson shades towards the rim of the glass. The nose is strong, filled mostly with black fruits flavours: black plum, blackcurrant, black mulberry, blackberry, black cherry, black plum jam, blackcurrant jam, black cherry jam, black soil and some insistent leather notes. An instant later the nose is filled with quite nuanced notes of black pepper, nutmeg, black tea, roasted oakwood and some subtle hints of cinnamon. The wine is dry, with high alcohol level, high acidity and firm tannin. It tastes quite fruity but opulent and tart at the same time, with a nuanced acrid-angular accent. This is a supple, lean and quite round wine blend, as it feels too young, not ripe enough, lacking a bit of structure and firmness on the mouthfeel. Still, the wine has a fair overall balance between fruit and wood, as neither of them dominates over the other. It has a medium-plus finish and a very acrid but, at the same time, lean aftertaste. This is definitely a fine Wine of Moldova and the overall rating says the same, with 90.4 points scored it is right there, among the best wines we’ve tasted so far. Please click on the chart icon on the left in order to get to the wine rating page, where you can find all the wines we’ve tasted to date. Conclusion: this is a quite nice wine blend that is still on the rise – a bit off its balance – a wine that has yet to reach the summit of its prime form, thus we are strongly advocating for a couple more years of bottle ageing (2 to 3 years should suffice). At the moment the wine feels quite austere as it tastes acrid and opulent, yet, despite its youthfulness, the potential is there – all it needs is a bit of patience. In order to counter-balance all that acidity in the wine, we would recommend to pair it with meaty dishes that are rich in umami flavours, like for example a ribeye steaks with red wine sauce or a cheese and cold cuts platter. Cheers!